One Direction say they're "blown away" after winning the inaugural Brit Award for global success. It's in recognition of their huge international sales. Speaking after this year's awards at London's O2 Arena, singer Harry Styles said the award was "crazy". The band also revealed details of an upcoming 'access all areas' film. Emeli Sande, Ben Howard and all the night's big winners here. 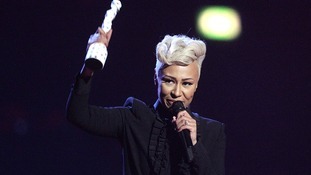 Emeli Sande's Our Version Of Events has won the Brit Award for British album of the year. Bryan Ferry presented the award to the Scottish singer. After they both lost out to Ben Howard in the best British male category, Olly Murs tweeted this picture of him and Calvin Harris "drowning their sorrows". Frank Ocean has been named best international male at the 2013 Brit Awards.